We are family of five musicians from Rēzekne County, Latvia – mom RASMA, dad GUNĀRS and daughters LIENE, MARTA and LAIMA. We started to perform on stage back in 1991 (with Baltica ’91 Festival). 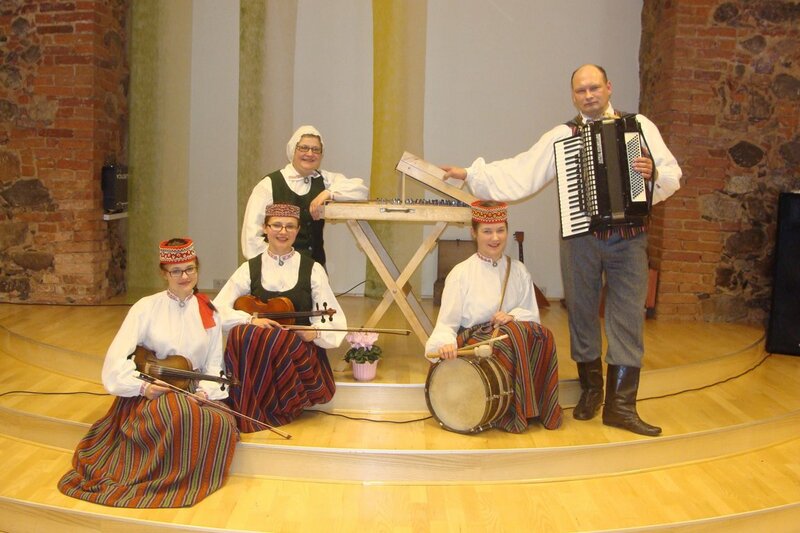 In our band we play wide variety of instruments: Gunārs – accordion, pipe, kokle, garmon; Liene – mandolin, violin, garmon; Marta – violin, mandolin and various percussion instruments; Laima – drums, pipe and flute; Rasma – sitar, accordion and pipe. We play and sing cheerful and heartwarming polyphonic Latgalian folk or popular songs, all so beloved by our people. We teach others about Latvian and Latgalian folk dances and plays. Rasma and Gunārs also perform together at various dance parties, jubilees and weddings. As family we perform in many locations around Latvia, while not forgetting to attend concerts and festivals abroad. So far we have represented our country in Lithuania, Estonia, Poland, Uzbekistan, Italy, Portugal, United States and multiple other places. Musicians are known to be flexible and diverse people, therefore we have found ourselves welcome in various private events. One of such challenges was back in autumn of 2009, when we took part in our national TV show called “Singing Families”.